Limestone College in Gaffney was established in 1845 as the first female college in South Carolina. Dr. Thomas Curtis of London, England, and his son, William, founded the school in order to provide an education to women who might not otherwise have such an opportunity. The school, originally called Limestone Springs Female High School, opened with 67 students. During the early 1900s the school began accepting males as day students. Males were permitted as residential students in the 1960s. While the Curtises were both ordained Baptist ministers, Limestone College remains a non-denominational Christian college. Following the Civil War, William Curtis, who served as president of the college following his father’s tragic death at sea in 1859, became financially destitute, and the school was sold at auction. Industrialist Peter Cooper of New York – the creator of the first steam locomotive in the United States and a staunch believer in egalitarian education for males and females – considered taking over the school and modeling it after the Cooper Union School in his home state, which he founded. Despite the collapse of these plans, the school continued to operate and its name was changed to Cooper-Limestone Institute in 1881. By 1898, the school was known by its now-familiar name, Limestone College. 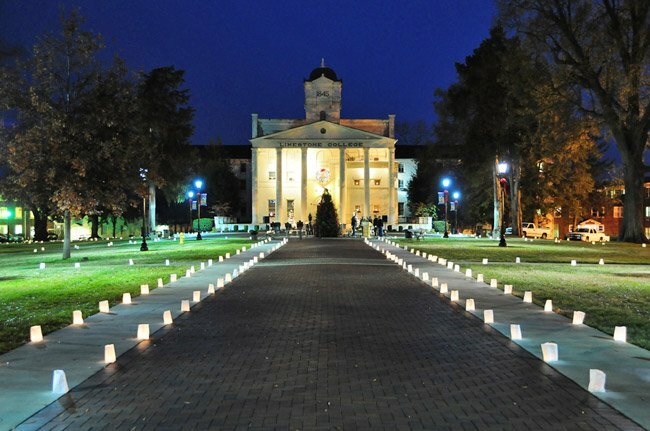 The picture at the top of this page shows the Lighting of the Luminaries in front of Cooper Hall, built in 1835. This Christmas tradition has been practiced at Limestone College each year since 1984. When this picture was taken on December 4, 2010, a drizzle of rain didn’t dampen the spirits of students and citizen volunteers who lit some 10,000 candles placed in sand inside white paper bags. The luminaries, which have become a popular drive-by event, shine brightly around the college campus, along College Drive, and on several other Gaffney streets all the way to the door of Gaffney City Hall. 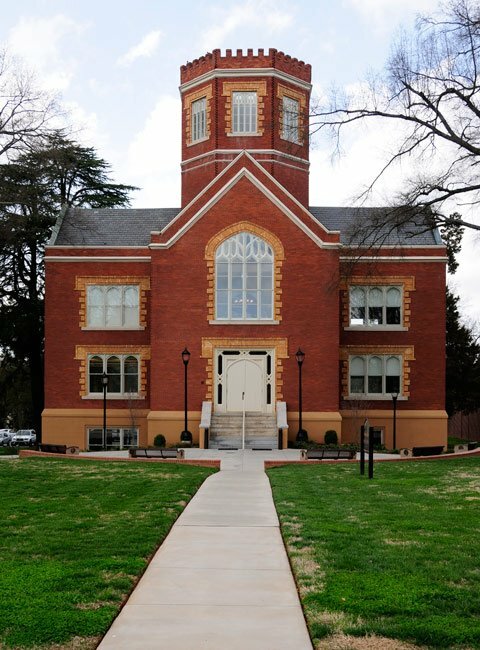 Completed in 1904, Winnie Davis Hall is named after the daughter of Confederate president Jefferson Davis. Its original purpose was to promote the study of Southern history and literature. Often called the crown jewel of the Limestone College campus, Winnie Davis Hall was closed to students and the public in 1976. Following a 2009 renovation, the building reopened in 2010 with state-of-art classrooms, faculty offices, a small kitchen, an outdoor plaza, and space for a history and arts museum. The Limestone Springs Historic District includes ten buildings and one site associated with Limestone College and the community of Limestone Springs. The district is a significant collection of properties reflecting the history of the area in the nineteenth and early twentieth centuries as a popular resort, as a center of lime production, and as a center of female education. The focal point of the district is the historic section of Limestone College campus, which contains nine buildings constructed between ca. 1837 and 1941. The buildings on the campus are oriented towards a central lawn and fountain. The buildings are classically inspired and include architectural styles such as Gothic Revival and Neo-Classical and also a meeting house form church. Also included in the district is a limestone quarry that was mined in the nineteenth and early twentieth century and a mid-nineteenth century church building. The limestone quarry is located adjacent to the historic section of the campus and the Limestone Springs Baptist Church is adjacent to the quarry. My great, great, great grandfather, Dr. Thomas Curtis and his son, Dr. William Curtis were the founders of Limestone. Our great grandfather, Beauregard Sumpter Curtis, was born during the Civil War on Campus. The girls of the college named him from General Beauregard and the fall of Fort Sumter. He eventually moved to Texas. Grateful to carry the Curtis name on by giving our son Curtis as his middle name. I look forward to visiting the college this year. My great grandmother, Annie Hackney of Rome, Georgia, taught “as a teacher of education in the Cooper Limestone Institute in Gaffney South Carolina” for 2 to 3 years around 1896. Any pictures or other information would be greatly appreciated!!!! My great, great grandmother attended Limestone College in the 1860s. Her name was Zulia Durham from Shelby, N.C. Does anyone have any pictures of that period or any records of her attendance? I like your site.